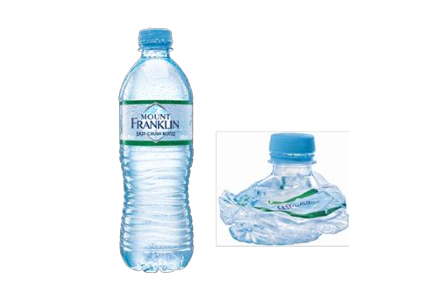 With 35% less plastic, Mount Franklin Spring water has a new package. Lighter, with less raw material and a reduced carbon footprint, the new bottles from the Coca Cola Company weigh only 12.8 grams and are the lightest weight Australian-produced 600ml spring water bottle. The Easy-Crush Bottle has won Gold in the Sustainability category of the 2011 Australian Packaging Design Awards. “The Mount Franklin Easy-Crush Bottle successfully promotes responsible behaviour by consumers. The simple twist and crush process reduces the size and amount of space needed to transport it to recycling centres. The increased crushability, material use reduction and increase in vertical load and stacking stability, has this entry ticking the sustainability boxes along its entire life cycle” said the judging panel. In a statement from the company the ‘Mount Franklin Easy-Crush Bottle’ is made possible by a multi-million investment in new technology which has enabled us to make lighter-weight beverage bottles, right across our bottling facilities nationwide. On our journey toward more sustainable packaging, all ‘Mount Franklin’ bottles will be light-weighted to reduce the amount of PET plastic. All bottles will also be made at the bottling facilities themselves, reducing our need for freight (mount Franklin). Keep Australia Beautiful Chairman, Don Chambers said “Our message is clear – let’s all do our best to be responsible for recycling and not littering. We’re think it’s fantastic that one of Australia’s biggest beverage manufacturers is meeting its packaging and product stewardship responsibilities through innovative design, and producing a new bottle which not only uses fewer of our planet’s resources, but makes it easy and fun for people to drink, crush and recycle their empty bottles.